A federal judge in Montana has reinstated legal protections for grizzly bears living in and around Yellowstone National Park. The move reverses a 2017 decision by US Fish and Wildlife Service officials to remove the bears’ protections under the Endangered Species Act. 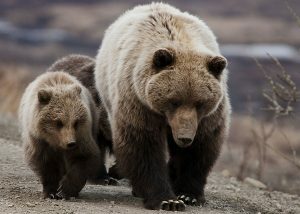 Chief District Judge Dana L. Christensen wrote in his ruling that removing the protections increased the bear’s risk of extinction. There are several geographically separated grizzly populations in the United States. Alaska’s population of grizzlies is considered a distinct group from the ones found primarily in Wyoming, Montana and Idaho. An estimated 50,000-100,000 grizzly bears roamed the Lower 48 states in the early 1800s. Today, there’s only about 1,700. Wildlife advocates and Native American tribes sued the Interior Department after it revoked the federal protections for the bears last year. Grizzly bears were among the first species granted protection under the Endangered Species Act. Government biologists say Yellowstone’s grizzlies are now thriving and are among the best-managed bears in the world. Unfortunately, the animals still face continued threats from climate change and loss of habitat. The move by Judge Christensen blocked planned hunts in Wyoming and Idaho. These were the first grizzly hunts planned in the US outside Alaska in nearly three decades. Wyoming officials had planned to let trophy hunters hunt up to 22 bears this fall. There was a planned hunt for a single bear in Idaho. Hunting advocates are now considering what their options may be.